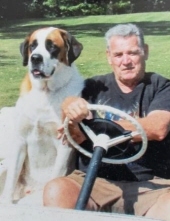 Celebrating the life of Lloyd D. McJury Jr.
Obituary for Lloyd D. McJury Jr.
Lloyd D. McJury Jr., 74, of Darien passed away on January 28, 2019 at the United Memorial Medical Center in Batavia. He was born on March 27, 1944 to the late Ernestine and Lloyd D. Mcjury Sr.
Lloyd was an avid outdoorsman who loved spending time hunting, snowmobiling and building Hot Rods with his only son. He enjoyed spending time in the Adirondacks with family and friends and snuggling with his granddaughters in his chair. He is survived by his loving wife of 51 years; Diane (Beeman) McJury; his son Ronald (Kylee) McJury; two granddaughters Paytin and Korryn; brother Kenneth (Sarah) McJury; sister Betty (Neil) Marzolf, along with many nieces, nephews and his fur grand-boys Tupper and Ruger! Family and friends are invited to call on Friday February 1, 2019 from 4:00-8:00PM at Marley Funeral Home, LLC. 135 Main Street Attica, New York 14011. A 10:00AM Funeral Service will be held on Saturday February 2nd at the Funeral Home. In lieu of flowers, donations may be made to Lloyd’s favorite hangout, the American Legion Harder O’Donnell Post 734 – 83 Market St. Attica, NY 14011. For more information please call (585) 591-1212 or to leave a message of condolence visit www.marleyfuneralhome.com. Arrangements completed by Marley Funeral Home, LLC. 135 Main Street, Attica, New York 14011. To send flowers or a remembrance gift to the family of Lloyd D. McJury Jr., please visit our Tribute Store. "Email Address" would like to share the life celebration of Lloyd D. McJury Jr.. Click on the "link" to go to share a favorite memory or leave a condolence message for the family.